The San Mateo-Half Moon Bay Road’s (Highway 92) famous “House of Doors” was built by Fred Nordholz, a German saloon owner. According to legend, the doors were used in buildings at the 1915 Panama-Pacific Exposition held in San Francisco. 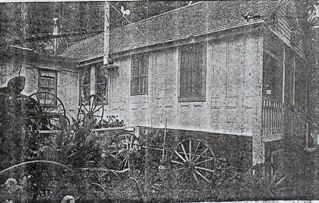 When the spectacular international show closed, Nordholz purchased the doors and shipped them down to Half Moon Bay where he built a house with them. Later in the 1950s Half Moon Bay’s colorful, outspoken Mayor Ann Howe (yes, think “An how!”) bought the house, hoping to turn it into a museum.